Entrancing folk with blistering czardas, grief-stricken ballads and rollicking dances, the Budapest Cafe Orchestra cast an intoxicating spell on all who experience their performances. After a string of sell-out Artsreach tours this smoking hot gypsy band is back - presenting songs from their new album. 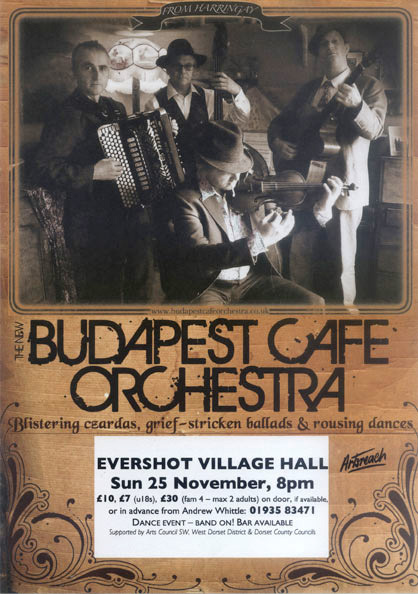 With performers Eddie Hession on free bass accordion, Kelly Cantlon on double bass, Chris Garrick on violin (& hair tricks), and Adrian Zolotuhin on guitar, the romance of the Budapest Cafe Orchestra will resume once again!